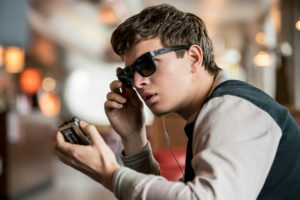 Baby (ANSEL ELGORT) charms Debora as she works in TriStar Pictures’ BABY DRIVER. Baby (Ansel Elgort) is the self-given name of a musically talented young man who’s a getaway heist driver. He suffers from tinnitus, donning ear buds connected to an old-school iPod chock full of mixes that he created to help block out the constant ringing in his ears. We know from the get-go that sunglassed Baby is troubled, as he doesn’t mix well with the heist teams that are formed by Doc (Kevin Spacey), a man Baby stole from as a teen; thus he’s been paying off the debt in return. Baby’s persona does garner trouble. Secretly, Baby wants out of the heists and tells Doc they’re even with the next job. The Bottom-Line? Edgar Wright’s creative mix of music with everyday sounds has upped the bar in filmmaking. The choreographing of chase-scene driving with musical beats and sounds produces exhilarating sequences. I can also recommend downloading the spectacular soundtrack. Notably, we’re now privy to a new kind of chase driver, one with a good heart and a musical soul.